To help project sea level rise along the Washington coastline in a newly released report, two UO researchers looked to the land. The report, led by Washington Sea Grant and the University of Washington’s Climate Impacts Group, estimates a rise of about 1.5 feet to 7 feet by 2100 for Oregon’s northern neighbor. The lower end of the projection assumes limits on greenhouse emissions. The higher level assumes greenhouse gas limits and also includes the latest science on the effects of melting Antarctic glaciers under certain scenarios. The report provides probabilistic estimates for 171 coastal sites each decade from now until 2150, from Neah Bay to the San Juan Islands to Olympia. It is based on updated science, the 2012 national report for sea level rise along the West Coast and a 2008 report led by UW's Climate Impacts Group. Coming up with the projections was complicated. Land motion, such as vertical uplift at Neah Bay and sinking in Seattle, if not included, could skew actual sea level rise. Enter Ray Weldon, a professor, and Tyler Newton, a doctoral student, of the UO Department of Earth Sciences, who applied spatial information using GPS technology and other types of land-based data. Land motion in the Pacific Northwest is driven by adjustments resulting from ice-age melt, seasonal groundwater fluctuations, sediment compaction and localized faulting. In Washington, the main contributor is the accumulation of tectonic strain from the Cascadia subduction zone. “GPS is just reaching the point of having sufficient vertical precision,” said Weldon, who is among a handful of scientists applying the tool to understand tectonic strain. Incorporating vertical land movement helps to balance the relative sea level rise that one experiences at the coast, because it helps account for forecasted sea level rise and changes in land elevation, Weldon said. The projections, posted online July 30, include an embedded Google map where anyone involved with planning projects or those who own property along Washington's coasts can access estimates for their location. "Previous assessments were zoomed out and were not fine-scale enough to capture the variations in land movement along the coastlines," said co-author Harriet Morgan, a research consultant with the UW Climate Impacts Group. 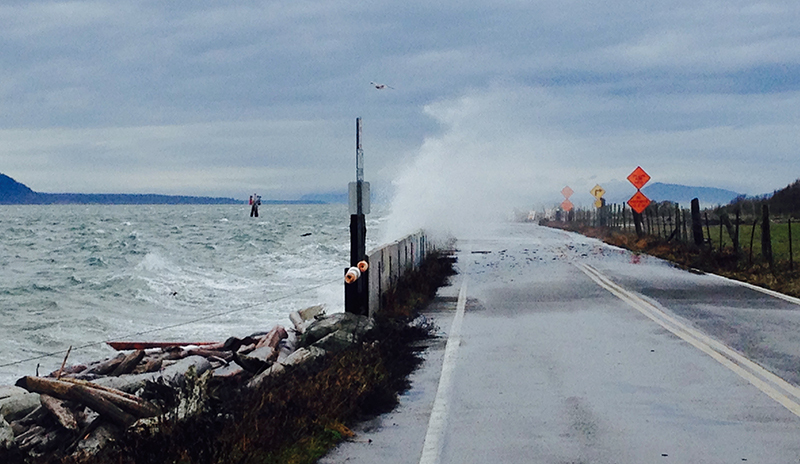 "Neah Bay is rising, and south Puget Sound is sinking. That up and down movement has a pretty big influence on how far the ocean will be able to travel inland." The new report is part of the Washington Coastal Resilience Project, a three-year effort funded in 2016 by the National Oceanic and Atmospheric Administration. Such a study has not been done for Oregon, the UO team members said. “Oregon's coastal communities would benefit from a similar study, which could help identify areas with increased susceptibility to flooding and erosion,” Newton added. For more information, see the UW news release, "Sea-level rise report contains best projections yet for Washington’s coasts," or the report, Projected Sea Level Rise for Washington State.